ATAC Announces 1,685,000 oz Gold in… | ATAC Resources Ltd.
June 18, 2018 – ATAC Resources Ltd. (TSX-V:ATC) (“ATAC”) is pleased to announce a maiden Mineral Resource estimate for its Osiris Project at the Rackla Gold Property, Yukon.The Osiris Project is 100%-owned by ATAC and is located outside of the area currently under option to Barrick Gold Corporation (“Barrick”). The resource estimate for the Osiris Project was completed by Mine Development Associates (“MDA”) of Reno, Nevada. 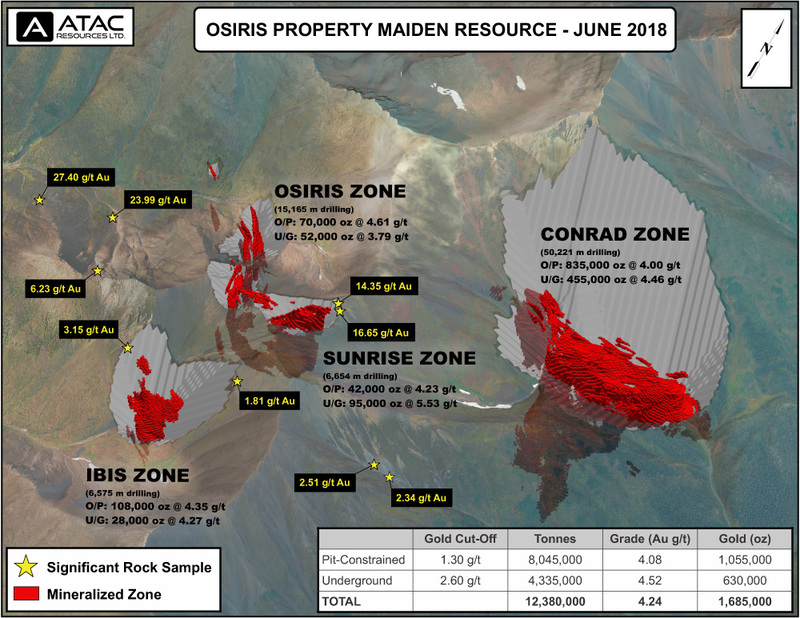 All zones outcrop at surface and remain open in multiple directions; a 10,000 metre drill program is currently underway to increase the Osiris resources. 1 CIM definition standards were used for the Mineral Resource.The Qualified Person is Steven Ristorcelli, C.P.G. of MDA. 2 Numbers may not add due to rounding.Mineral resources that are not mineral reserves do not have demonstrated economic viability. The Osiris Project is located at the eastern end of the Rackla Gold Property and hosts numerous Carlin-type gold zones and targets. The Conrad, Sunrise, Osiris and Ibis zones included in the resource estimate occur as replacement bodies with both structural and stratigraphic control.All zones are open in multiple directions. Please see the table below for resources by zone. Step-out drilling is underway with two drills at the eastern end of the Conrad Zone near drill hole OS-17-238, which intersected 12.50 m of 20.78 g/t gold. Drilling will begin shortly at the Sunrise Zone with a focus on stepping out from mineralization intersected in drill hole OS-17-249, which returned the highest-grade mineralized intercept to date, with 15.24 m of 13.52 g/t gold and 10.42 m of 7.97 g/t gold. The Sunrise Zone is located on a ridge-top and has only been tested for a 300 m strike length and a vertical depth of 350 m.
Excellent potential for new discoveries exists at the 302 km2 Osiris Project. 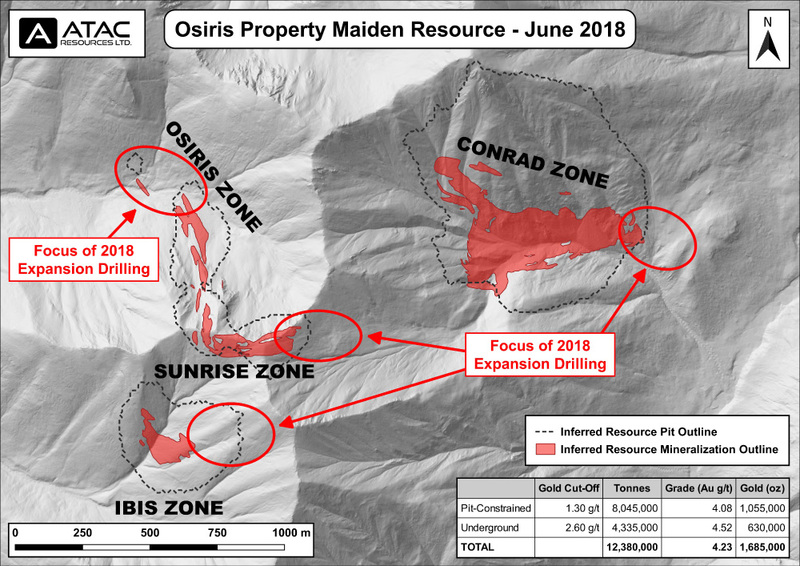 Additional mapping, prospecting and rotary air-blast drilling will be conducted throughout the Osiris Project to test for extensions or new areas of mineralization. 1 CIM definition standards were used for the Mineral Resource.The Qualified Person is Steven Ristorcelli, C.P.G.of MDA. The June 2018 Mineral Resource estimate is based on diamond drilling completed at the Osiris Project between 2010 and 2017.Data analysis, domain modeling, grade interpolation and classification were undertaken by Steven Ristorcelli, C.P.G. of MDA.The estimate was prepared using 238 diamond drill holes totalling 78,614 m.
Explicitly modelled gold domains were interpreted using wire frames of the geological model as a guide. In each of the Conrad, Sunrise, Osiris, and Ibis zones, high- and low-grade gold domains were modeled.The grade ranges for the domains were defined separately for each zone based on population breaks for gold on cumulative probability plots, and each domain represents distinct and unique geological and mineralogical characteristics.Outliers within each domain were capped prior to three metre down-hole compositing. Gold grades were estimated into the block model using inverse distance to the third power.Separate estimations using polygonal, nearest neighbour, and ordinary kriging were also completed for validation purposes. For reporting, technical and economic factors likely to influence the “reasonable prospects for eventual economic extraction” were evaluated by running a series of pit and mine-stope optimizations at variable gold prices, mining costs, processing costs, and anticipated metallurgical recoveries. MDA reports resources at cut-offs that are reasonable for deposits like those at Osiris, given anticipated mining methods and processing costs. A gold price of US$1400 per ounce was used to determine the cut-off grades.Tables showing the pit-constrained and underground Mineral Resources at varying cut-off grades are presented below. The Mineral Resource estimate was completed by Mine Development Associates.Steven Ristorcelli, C.P.G., Principal Geologist with MDA is the Qualified Person for the purpose of National Instrument 43-101 for all technical information pertaining to the current Mineral Resource. All other technical information in this news release has been approved by Matthew R. Dumala, P.Eng., a geological engineer with Archer, Cathro & Associates (1981) Limited and Qualified Person for the purpose of National Instrument 43-101. Further details supporting the geological model, estimation procedure and metallurgical testwork will be available in a National Instrument 43-101 Technical Report authored by Steven Ristorcelli, C.P.G., of Mine Development Associates, Peter Ronning, P.Eng., of New Caledonian Geological Consulting, Odin Christensen, C.P.G., of Hardrock Mineral Exploration Inc., and Chris J. Martin, C.Eng., of Blue Coast Metallurgy Ltd.The report will be posted under the ATAC profile at www.sedar.com within 45 days from the date of this news release. * Discovery costs were calculated using a cumulative exploration cost for the Osiris Project of $53,168,791. Costs included drilling, helicopter, assays, labour, fixed wing, camp costs, fuel, general camp consumables and winter office work. Globally competitive discovery costs referenced from MinEx Consulting - Technical presentation to the Melbourne Branch of the AusIMM 7th June 2016. ATAC is a Yukon-based exploration company focused on developing Canada’s only known Carlin-type gold district at the Rackla Gold Property. 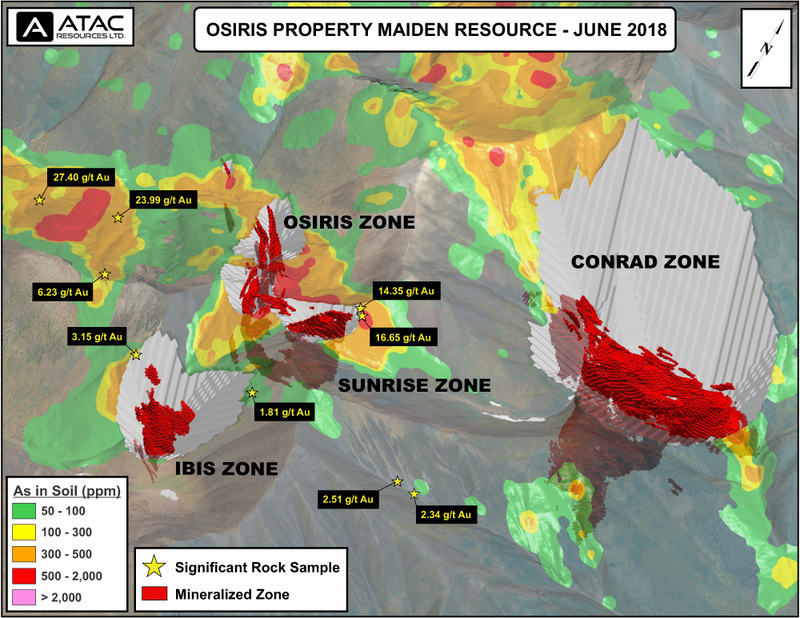 Recent work on the ~1,700 km2 property has resulted in a positive Preliminary Economic Assessment for the Tiger Gold Deposit, defining a maiden Osiris Project resource of 1,685,000 oz gold and the identification of numerous early-stage gold exploration targets. ATAC and Barrick are in partnership exploring the Rackla Gold Property’s Orion Project, with Barrick having the option to earn up to 70% of Orion by spending $55 million in exploration. ATAC is well-financed with approximately $18 million in its treasury.